My Aspergers Child: Should I tell my child that he has Aspergers? We struggled with this issue for some time, and eventually sat our son down and told him. In our case, he kept asking why the other kids called him "weird". To tell or not tell your youngster or others of their diagnosis of Aspergers (high functioning autism)? It’s really a personal decision that has pros and cons on either side. Some parents may struggle with telling a 3 year old they have Aspergers, fearing they may not understand; that it could frighten them. While saying directly “The doctor says you have Aspergers,” may be unnecessary, talking about the characteristics of Autistic Spectrum Disorder in a way the youngster can relate to is vital in helping the youngster towards self-acceptance as they mature. 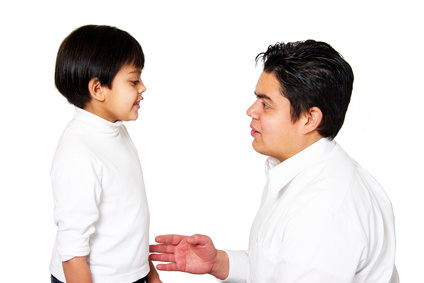 Being open about your youngster’s different way of thinking and processing, and connecting those traits to Aspergers characteristics is the key to success in helping your youngster towards self-acceptance. The earlier they become comfortable with Aspergers ‘shop-talk’ the easier it will be when they are pre-teen and adolescent age. Kids with Aspergers need to be able to focus on their strengths more than ever at this age when their social-skill deficits can seem more prominent. Remembering though that people on the Autistic Spectrum do not always ‘connect the dots’ in the correct order, it may be necessary at some point to say “You have Aspergers” for clarification. So should you tell your youngster’s part-time employer about Aspergers…and if so, when? When they are applying for a job? When they get the job? Or never? This also comes down to personal choice. However, sometimes it can be helpful to have an employer support contributing to the success of your youngster’s employment experience. So far we’ve been very fortunate in the employer’s who have given our son a job. They’ve been very understanding, and have helped by finding out about Aspergers, and matching the strengths of Aspergers with the duties/tasks assigned to him. They’ve praised his work ethic, his efficiency, his enthusiasm and manners. They’ve been understanding and compassionate when his anxiety or depression has caused him to miss work, and not held it against him the next time he’s there. Just as someone may miss work due to asthma, or the flu they understand that depression/anxiety is part of Aspergers. The members of our family have reached the stage where telling about Aspergers is just like saying “my eyes are blue” – a comment that helps the listener come to know you (or your son or brother) a little better. After all, life is a never-ending quest to make connections with others, whether fleeting or lasting! Karen Gomez Vega ok then, another question-how do you explain it in terms that a 6 or 7 year old can comprehend? they already know that they are different and need extra help, we have watched parts of parenthood where max melts down or withdraws (we have one that internalizes and one that acts out) and talked about another aspie boy at their school and how he has a hard time too. they have also been to events with other children with aspergers and autism and i run a support group in coordination with CARD. i feel confident they know what is going on and understand it i just have not labeled it per se. thanks for your thoughts! Karen Gomez Vega thanks so much everyone. they are not asking questions yet i just try to explain what is happening to them so that we can work on it as a team. we have a counselor and a behavioral therapist plus their school is amazing so we are very blessed in that respect. i know we will have the talk about autism and aspergers at some point. we have already gotten the sensitive sam book but they did not really get it so we will re read as they get older and get other books too. again, thank you so much all! My son is 5 and the kids are just starting to call him weird and other things.He knows he's different and I am gonna tell him soon.I just don't know how much and how to say it.